Improve any recipe by using freshly ground black pepper. McCormick Whole Black Pepper comes from a perennial vine piper niger. The berries are dried, and can be used whole in soups and stews or ground. 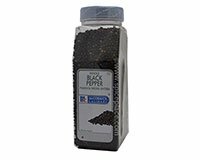 Fresh ground pepper has stronger, more robust taste then packaged ground pepper. Most professional cooks recommend grinding pepper right before use to provide the most fragant and spicy taste. Since the pepper flavor comes from the oil of the berries, add pepper at the end of a recipe for the best taste. Egg Sausage Casserole More Recipes..